Sea, Sand & Sky: Piers Park, All Access, AND Carson?! Oh my! New week, new exciting stuff to share! Special shout out to all of our followers, especially our dedicated readers! The following joke is for you: Why don't fish like basketball? Read more to find out why they don't... the answer is below! I started off my first official week on Monday at Piers Park with the lovely Meaghan, and her crew of lively JPAs + LHE Michael. It was an extremely hot day, but the view was INCREDIBLE! Sailboats blanketed the water, and smaller groups of kids kayaked with counselors. On the dock, we fished, catching an occasional crab. 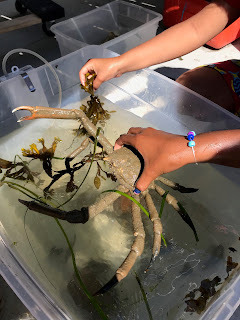 One child caught the biggest spider crab I have ever seen! The kids also found a moon jelly, and were extremely excited to touch it. After lunch, the kids played a recycling activity, and learned about the 3 Rs: Reduce, Reuse, and Recycle! They walked around the park, collecting litter on the ground, and got "points" per item they found. One kid got really into the game, and wanted to continue throughout the rest of the day. 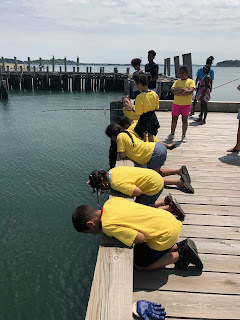 Tuesday to Thursday, Deonte and I led a successful few trips to Georges Island with David Coffin, and our incredible group of LHEs and JPAs! We started off with a fairly small group of only 90 people, but Wednesday we jumped up to around 430! 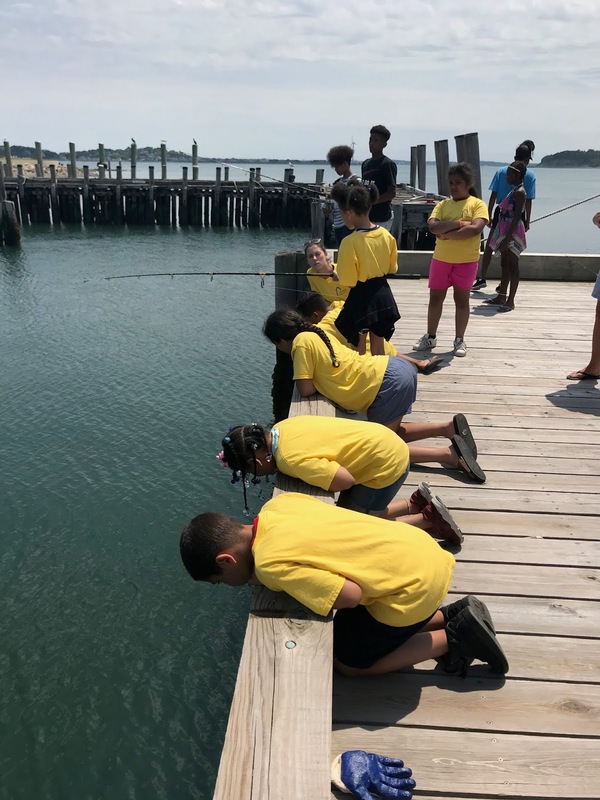 We saw some incredible groups from around Boston, and got to show hundreds of kids around the island. So many children were thrilled to be fishing. Although we only caught crabs, everyone was so happy to be there. Thursday, our crab trap got stuck due to the rising tide, resulting in many of us climbing down to the water to try to pull it out of whatever it was stuck on (likely the dock ugh!). Eventually, JPA Patrice took off her shoes and socks, hopped in the water, and--using her toes!--saved the day! We caught more than thirty crabs, but unfortunately, since it took so long to get the crab trap undone, we had to toss them right back in the water as we headed back to Boston. On Friday, I joined a handful of SHSB staff at Carsons Beach for our first "mini" beach bash! A few hundred kids showed up--some familiar faces from one of Wednesday's AABH groups--Braintree After School Enrichment (BASE). I met two kids who share my name--hi Kaya #2 & #3! The day was full of fishing, kayaking (thanks to Piers Park Sailing Center staff), swimming (thank you YMCA of Greater Boston! ), arts & crafts, face painting, and MORE! The kids really enjoyed themselves, and many kids were able to fish for the first time--catching dozens of crabs from shore! What a great week packed full of fun events! Can't wait to share more next time! A: Because they're afraid of the net. Get it?